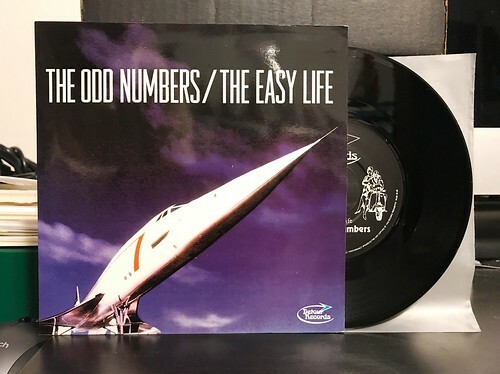 I Buy Way Too Many Records Dot Com: The Odd Numbers - Easy Life 7"
I've still got a few more Odd Numbers 7"s to get through, so there's several more Mondays dedicated to their records coming up. Today we have The Easy Life, a 7" of theirs from 1995. I bought this one on Discogs along with a handful of other records a couple of weeks ago, mostly looking to fill holes in my collection. The two songs on this 7" also make appearances on the Odd Numbers album A Guide To Modern Living. When it came out, I was kind of disappointed in that album. I didn't like it nearly as much as I liked Jazz Cigarettes so I honestly didn't listen to it all that often. In fact, I didn't even end up keeping the CD of it as I must have sold it off during one of the purges of my CD collection. Listening to it again, as I've gotten older, I actually like it a lot more than I did back then. The versions of the songs on this 7" are different than the album version. Both seem a little muddier with a bit more fuzz and distortion on the guitars. In particular, "The Easy Life" is a toe tapper and I find myself bobbing my head along to it as I listen. But the version on the album is much cleaner and catchier. "Clubbin'" is a little longwinded and meandering for me. It's not really the Odd Numbers' best work if I'm being honest. Still I wanted to lock down all of the Odd Numbers 7"s, so this was one that needed to be added to the pile.